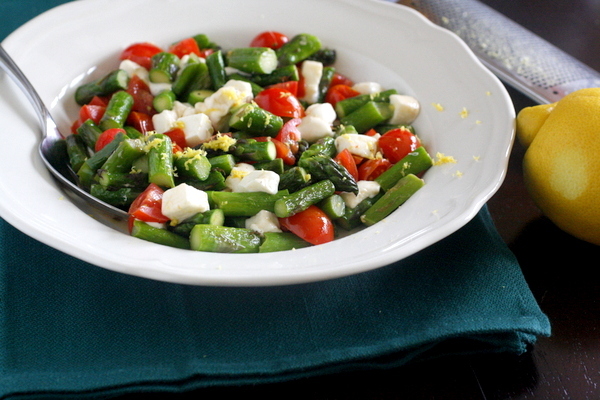 If you like asparagus, you will love this recipe! 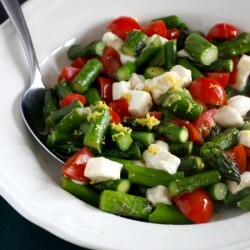 I am always looking for new ways to cook asparagus, and I think it’s safe to say that this is a new favorite. Fresh asparagus is delicious this time of year, especially when sauteed in olive oil with a little bit of salt and pepper – simple and delicious! I also added in some fresh mozzarella for flavor and texture (and a nice dose of protein!) and some juicy cherry tomatoes. I love making use of fresh produce in the spring in summer – everything is so good on it’s own that you hardly need any extra flavorings. 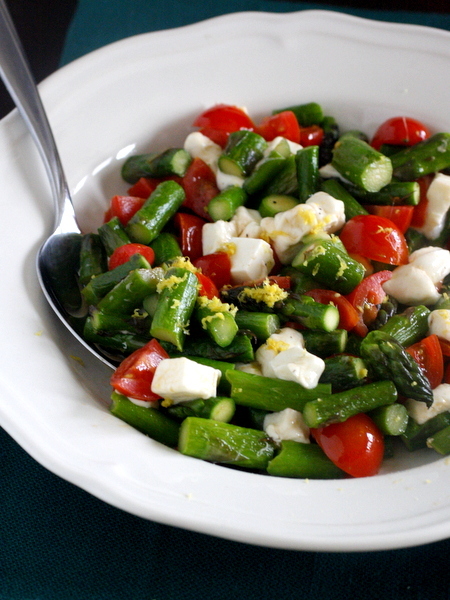 For this asparagus dish, I just added in a little lemon zest at the end, which ended up being the perfect extra burst of flavor. Mike and I both devoured this dish, and we liked it so much that I made it again the next day! The second time we even added in a few extra vegetables and some leftover roasted chicken to make it into more of a light meal. I think it’s safe to say this recipe will be a staple in our house this summer! Slice the cherry tomatoes into halves (or fourths, depending on how big they are) and set aside. Cut the mozzarella into small bite-sized pieces and set aside. Trim the asparagus and slice into 2-inch pieces. Heat the oil in a large skillet over medium heat. Add the asparagus and sprinkle with salt and pepper. Cook, stirring occasionally, until tender, 4-6 minutes. Remove from heat and stir in the cherry tomatoes and mozzarella. Sprinkle with lemon zest and serve immediately.